For the times when you need that big-mixer sound in something that you can fit in your backpack, the Behringer Xenyx Q802USB Ultra-Compact Mixer is here for you. Complete with 8-inputs, phantom power, USB connectivity and a built in audio interface, this is the perfect mixer for gigging musicians and home producers. The Q802USB utilises Behringers state-of-the-art Xenyx mic preamps giving your vocal immediate life. One-knob compression means that you can have accurate dynamic compression on your vocal or instrument, something that you would need an individual compressor for normally. Each channel also gives you access to a neo-classic British 3-band EQ capable of adding warmth and vigour to your sound. Of course, channel volumes can be easily altered and there is also a visual warning of any clipping on each channel whilst a master LED meter gives you a visual on the complete mix along with power and phantom power status. The Xenyx Q802USB may be ultra-compact but it makes sure that no matter what your workflow is, it can fit in with ease. USB and power ports can be found on the rear of the mixer whilst everything else is conveniently on top. Because of the USB and interface capabilities of the Q802USB you can record and playback audio with your Mac or PC - again, no extra equipment needed. Should you wish to use any additional effects the Q802USB has sends and return including a post fade mix knob so that you can subtly adjust the effects level to your liking. Behringer have included a key to download lot of free software with the Q802USB to ensure that you can be up and running in no time. Audacity gives you all you need to deep-edit audio, create podcasts, splice mixes and so much more. Traktion audio production software brings together outstanding Pro DAW features, such as dynamic automation, unlimited track count, MIDI recording and support for VST and AU plug-ins. 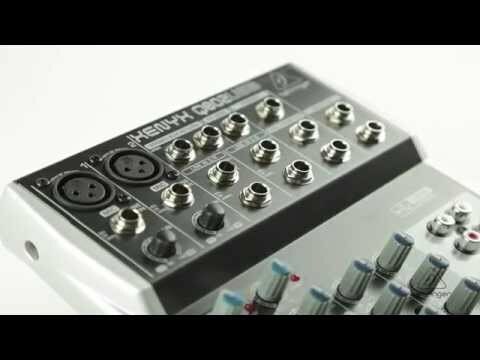 The Behringer Xenyx Q802USB Ultra-Compact Mixer may be little but it has massive potential for your gigging and recording life. Behringer have also included this as part of their 3-year warranty plan as testimony to its excellent build quality.